If you don’t have an ice cream maker, don’t fret. 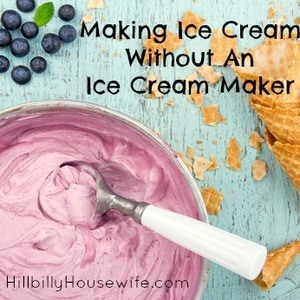 You can make ice cream at home without the aid of either a hand-cranked machine or an electric ice cream maker. How? All you need is a freezer, and a little muscle. Here’s how to do it. This will work with any ice cream recipe. To begin the process, put a shallow stainless steel bowl in the freezer to get cold. Now, in a separate mixing bowl, combining the ingredients as stated in the recipe directions. Set the bowl (with the ingredients in it) in a larger bowl filled with ice and salt. Let chill for five to ten minutes, stirring ingredients with a whisk or spoon until mixture gets cold. Pour the cold ingredients out of the bowl you mixed them in and into the ‘frozen’ stainless steel bowl in the freezer. Put ‘frozen’ stainless steel bowl with ingredients back into freezer, then check in about 15 to 20 minutes to see if the mixture is starting to get frozen around the edges. If so, take a heavy whisk, slotted spoon, or electric hand-mixer and stir the mixture, briskly, breaking the frozen edges up and beating into the rest of the mixture. Rapid, brisk stirring will help the ice cream get smooth and creamy. Once the ice cream has set up properly, is smooth, creamy, and semi-solid, transfer it into a freezer container with a cover. Cover and store in freezer for at least one hour before serving; longer if you like it more firm. Yes, it’s a little extra work and takes a bit of time, but well worth it when the end result is a creamy bowl of ice cream. 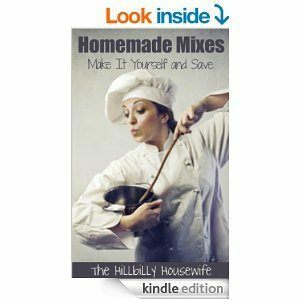 Get everyone in the family involved and have them take turns mixing the mixture. Of course if you find yourself loving this hand-made ice cream, it may be worth looking into ice cream makers. You can often find great deals of them online and at local thrift stores. Or ask around… chances are one of your friends or family members has one sitting around that they aren’t using. 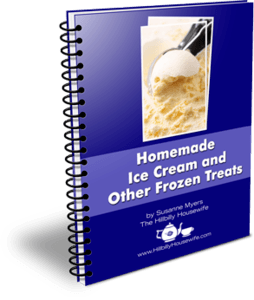 For lots of delicious homemade ice cream recipes, grab a copy of my ebook Homemade Ice Cream and Other Frozen Treats right here. You’ll find instructions for making ice cream – with and without an ice cream maker – as well as 100 delicious recipes for a wide variety of ice cream, frozen yogurt, sorbet, sherbet and even homemade popsicles. Click on and Get your copy today!